The Union Home Minister Rajnath Singh has called upon the Central Armed Police Forces (CAPFs) to launch Special Recruitment Drives for Women to achieve the goal of 33% reservation for women. Addressing the 49th Raising Day Parade of the Central Industrial Security Force (CISF) in Ghaziabad today, he also asked the Force to prepare and strengthen its Cyber Security Plan.Shri Rajnath Singh said data theft, hacking and cyber crimes have added a fourth dimension to industrial security. Considering the changing security scenario, he said the Cyber & Information Security (CIS) Division has been recently created under the Union Ministry of Home Affairs (MHA).Quoting CISF motto “Duty with smile”, the Union Home Minister said air travellers have lavished praise on the CISF personnel for their politeness while ensuring foolproof security at airports. However, calling upon the CISF personnel not to lower guard and always remain vigilant, the Union Home Minister, in a lighter vein, said being too courteous should not mean lax security.Shri Rajnath Singh said as India’s economy will surpass the $5 trillion mark in a few years, we will need to boost critical infrastructure including airports, metro and high-speed railways. Since security to such vital infrastructure and strategic installations including space research and nuclear power plants lies in the safe hands of the CISF, he said the Force is thus contributing to India’s development and nation-building. The Union Home Minister noted that the CISF has also been providing Consultancy Services in industrial security to the corporate sector.Shri Rajnath Singh asked the CISF to roll out its Mission 2020 ahead of the “Amrut Mahotsav” (75th Anniversary) celebrations of India’s Independence in 2022. 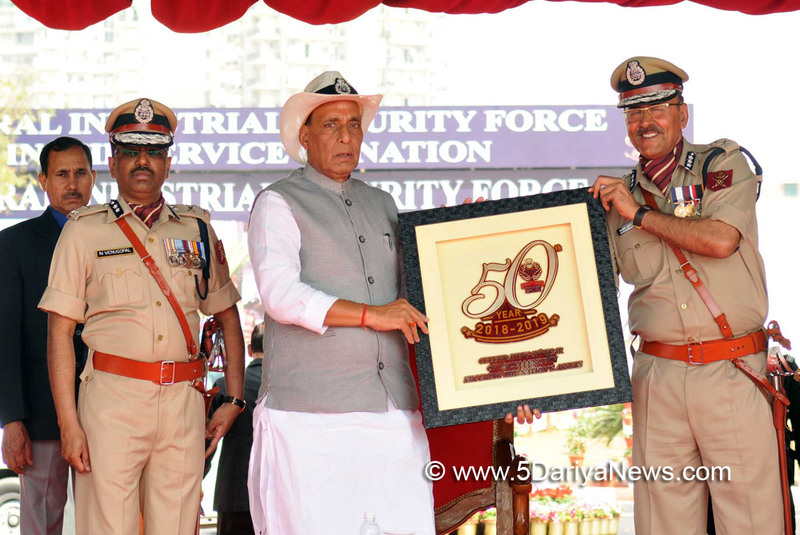 As the CISF enters its Golden Jubilee Year, he lauded the world’s largest industrial security force for its multi-dimensional roles including Internal Security in combating Left Wing Extremism.On the occasion, the Union Home Minister presented awards and medals to CISF personnel and took the salute of an impressive parade. He also released the CISF Coffee Table book.